I usually make black soy milk on its own without adding any other ingredients. Inspired by the ingredients used to make Bonsoy, I decided to give a try by adding Job’s tears to my black soy milk. 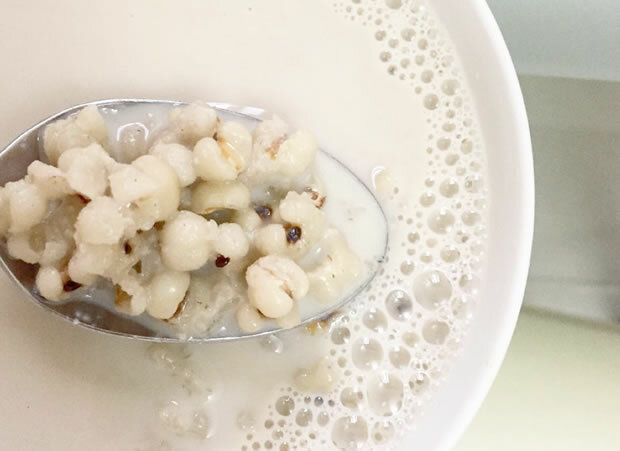 Job’s tears gives a slight nutty flavour to the soy milk and I love to drink it when it’s warm. Black soybean has a neutral thermal nature. It strengthens spleen, pancreas and kidneys, improves blood circulation, diuretic, removes toxins from the body. Black soy bean has little nutritional difference from yellow soy bean except in the pigment of the hull. Japanese researchers have found that black soybeans contain anthocyanin, a type of polyphenol found in high concentrations in blueberries and raspberries. Anthocyanin is known to work in the body as an antioxidant too. Another study also showed that the black soybean is more effective than the yellow soybean in preventing menopausal symptoms. It is also a good source of protein, magnesium, phosphorus and manganese, and a very good source of dietary fiber and folate. Job’s tears (also known as Hatomugi) is a traditional Chinese medicinal grain which is used to to invigorate the spleen function and promote urination, alleviate arthritis, arrest diarrhea, remove heat, facilitate the drainage of pus, promotes weight loss, improves blood circulation, prevents heart disease and high blood pressure. It’s a good defense against cough, phlegm and indigestion. Job’s tears is not related to barley at all and is different from the barley drink we get from coffee shops and stalls. Read here and here to find out more. It has the best amino acid profile among all the grains, and is rich in calcium, phosphorous, iron and vitamins B1 & B2. Rinse and soak the black soy beans overnight or for more than 10 hours. Rinse and soak Job's tears over night. Boil Job's tears with water using low fire for 30 minutes. Juice the black soy bean milk using Hurom Juicer by adding one portion of black soy beans and one portion of water to Hurom juicer each time until all the soy beans and water are finished. Alternatively if there's no Hurom juicer, blend the black soy beans with water and then filter the pulp from the soy milk by using a muslin bag. Combine the filtered black soy milk and semi-cooked Job's Tears to a pot and boil them using low fire for an additional 30 minutes. Stir the soy milk regularly to prevent it from being burnt. After 30 minutes, add sweetener of your choice to add a sweet taste and it's ready to be served. Job's Tears need to be boiled in water for at least 45 minutes to be completed soft.